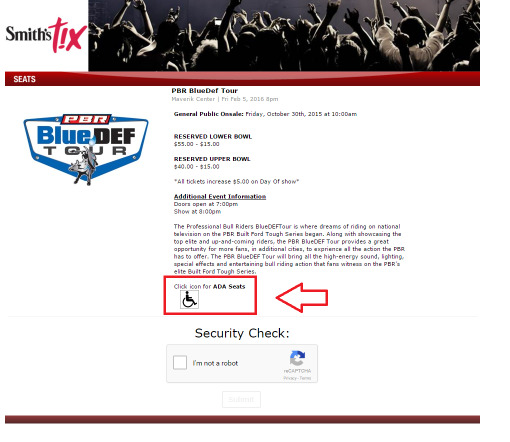 Maverik Center recognizes the needs of guests with disabilities, as defined by the American Disabilities Act (ADA) of 1990. Maverik Center continues to make every effort to comply with state and federal accessibility regulations and accommodate guests with disabilities. Maverik Center offers accessible seating locations. This guide is intended to highlight some of the features available at Maverik Center for guests with disabilities. If you need assistance during an event, you may visit Guest Services in the main concourse outside of Section 120. You may also reach a Maverik Center representative at 801-988-8800 during normal business hours. Available outside the Maverik Center Box Office on Floor 2. Parking spaces for guests with disabilities are located in Parking Lots A, B and C. Accessible parking is available on a first come, first serve basis. The vehicle must display a handicap parking placard or license plate. 100% of UTA's fixed route bus services are wheelchair accessible with lift-equipped or low floor buses. In addition, other accommodations such as stop announcements made by drivers and assisting passengers with disabilities make using the fixed route bus service possible for many people with disabilities. For tips and instructions on how to ride UTA fixed route buses and TRAX, click here. For information on UTA's Paratransit Services, click here. Maverik Center can provide escorts to parking areas for guests with special needs. This service is free and can be requested through Guest Services. To minimize your wait, we suggest that you make arrangements for this service prior to the event you are attending by calling 801-988-8800. Service animals are welcome inside the building and must remain on a leash or in a harness at all times. If you intend to bring a service animal to the building, please notify your ticket representative at the time of purchase so that an aisle seat may be reserved for you. Maverik Center can provide sign language interpretation for guests with hearing disabilities. Requests for this service must be received 15 business days prior to the event and be approved by the performer. For details, please contact the Maverik Center at 801-988-8800.